CineDrop is the second installment of CINE series. It is a modern, ultra cinematic, take on classic slowmo/downer sound effects with a dark twist. CineDrop (Cinematic Drop) is a library created with sound designers and gamedevs in mind. Control pace of your project, add suspense and drama and make those subwoofers hot. The collection consists of 57 carefully designed and rendered sound effects with baked-in Soundminer metadata. Find out what Euro Rack Synths morphed with modern digital synths and foley field recordings sound like. CREATED AND EDITED WITH: Modular, DBX 120A, TC Finalizer 96k, Reaktor, Serum, Live, Pro Tools. The BadBike is a rattling and broken bicycle that perfectly nails the sound of a worn out bike, it’s passbys and hardstops are hard too miss. 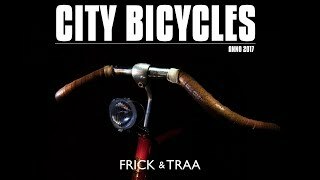 The BadBike library is part of the complete ‘City Bicycles’ library package available at www.frickandtraa.com. It consists of all 4 bicycles and includes additional surfaces and extras ranging from one-off bicycle passes captured in the city and bounces and rattles. The extra bicycles surfaces and additional effects are also available seperately here on ‘a Sound Effect’. If you’ve bought a single library and want to upgrade to the full package, contact us for a reduced price on the complete City Bicycles library. Every part of City Bicycles that you paid for will get you an extra reduction on the full package. This is a unique bicycle library that captures road surfaces from the perspective of super quiet bicycle. These are clean, quiet, nicely performed true exterior rides. Including multiple perspectives, speeds and actions. From fast passbys on asphalt to slow onboard recordings and smooth stops. The Extra Surfaces library provides 162 sounds captured on the following road types Large Bricks, Gravel, Grit, Icy Asphalt. The four additional ‘onboard road’ surfaces are the perfect extension for your other ‘City Bicycle’ library of taste. Just add it as a layer, mix it and voila your bicycle can move from gravel to bricks to grit or from large bricks to slippery icy asphalt roads. Three speeds. Departures from slow, medium to fast getaways. Arrivals from slow stops with gently brakes to smooth departures. The Extra Surfaces library is part of the complete ‘City Bicycles’ library package available at www.frickandtraa.com. It consists of all 4 bicycles and includes additional surfaces and extras ranging from one-off bicycle passes captured in the city and bounces and rattles. The extra bicycles surfaces and additional effects are also available seperately here on ‘a Sound Effect’. If you’ve bought a single library and want to upgrade to the full package, contact us for a reduced price on the complete City Bicycles library. Every part of City Bicycles that you paid for will get you an extra reduction on the full package. The GoodBike is a smooth sounding retro bike that doesn’t rattle or squeak, it has a really nice tire sound for a subtle presence in the mix. However, we are aware that some people have different needs for different purposes, so we've created a Metadata Reference Guide that explains the structure. And because we've automated the metadata proces, you can be confident that a 'find & replace' command will always replace all instances. The GoodBike library is part of the complete 'City Bicycles' library package available at www.frickandtraa.com. It consists of all 4 bicycles and includes additional surfaces and extras ranging from one-off bicycle passes captured in the city and bounces and rattles. The extra bicycles surfaces and additional effects are also available seperately here on 'a Sound Effect'. If you've bought a single library and want to upgrade to the full package, contact us for a reduced price on the complete City Bicycles library. Every part of City Bicycles that you paid for will get you an extra reduction on the full package. The RacerBike is that kind of bicyle the snobby double shot cortado drinker nochalantly parks in the window at his favorite barista. This vintage Koga Miyata is maintained very well, with fresh lubricants and perfectly lined up gears it’s a smooth racing devil that you pay nicely for second hand (we can tell, we are the coffee snobs). The RacerBike library is part of the complete ‘City Bicycles’ library package available at www.frickandtraa.com. It consists of all 4 bicycles and includes additional surfaces and extras ranging from one-off bicycle passes captured in the city and bounces and rattles. The extra bicycles surfaces and additional effects are also available seperately here on ‘a Sound Effect’. If you’ve bought a single library and want to upgrade to the full package, contact us for a reduced price on the complete City Bicycles library. Every part of City Bicycles that you paid for will get you an extra reduction on the full package. In need of some distinct bicycle passbys for a street scene? Missing some handling sounds of a bicycle? This library has the answer with superbly captured exterior recordings in the inner city without traffic. It includes various types of bicycles from the rattling sounds of a drunken cyclist or the smooth whirring of a nicely maintained bicycle with it’s headlight dynamo or the violent shrieking of a bicycle about to fall apart. And if that’s not enough you can always add more drama with the various handling effects we recorded, bounces / scrapes / skids / rattles it’s all here. Everything recorded in XY stereo and well described to make finding that one distinct bike easier. This library is part of the complete ‘City Bicycles’ library package available at www.frickandtraa.com. It consists of all 4 bicycles and includes additional surfaces and extras ranging from one-off bicycle passes captured in the city and bounces and rattles. The extra bicycles surfaces and additional effects are also available seperately here on ‘a Sound Effect’. If you’ve bought a single library and want to upgrade to the full package, contact us for a reduced price on the complete City Bicycles library. Every part of City Bicycles that you paid for will get you an extra reduction on the full package. City Traffic brings the daily noise of Berlin to your library. It delivers 10 different locations – split into 55 single takes with metadata embedded. The library contains recordings of main roads during the morning rush hour, when the trolley car rumbles over the rails and the trucks are roaring through the kettles. In between a bunch of honking mopeds and cars with broken exhaust pipes are fighting for their space. Commuter trains are crossing every minute, the omnibus arrives just in time and the long-distance trains pass the station with squeaking brakes. In the evening it is rainy and at least the suburb calms down a little bit. ‘Cityscapes and street’ is a collection of different atmospheres, recorded in Sofia, Bulgaria. Inside you will find various cityscapes from hectic street traffic through city parks, subway stations, pedestrian zones to quiet morning urban sounds. This package covers various city states and is an excellent choice for filling your library or using it in a project where urban environment is necessary. Enjoy the varied sounds of the city. Classic Car Pass Bys consists of 231 beautifully recorded and edited sounds, tagged with rich metadata. From Jaguar E-Types and Ford Mustangs, to Triumph Spitfires, Ferrari 250s and more. Closely Recorded Trains delivers interior spot effects of a 1950s UK steam-hauled train carriage, plus rides, station atmospheres and passes. Over 60 sounds to enhance your period productions. Basic metro bus found in Copenhagen, Denmark. The library contains recordings of horns, ignition starts, idols, drive offs, turning, drive by on wet pavement, multiple interior perspectives with and without people, clicks, buttons, voice announcement, travel card check in, check out sounds, route stop chime, basic foley, backing up, and engine whirrs. Download the sounds list to see a full list! High quality unprocessed drone/quadcopter recorded using both binaural and mid-side microphone techniques. 4 different types of quadcopters were used in this sound library. This plane sound effects library features the American World War II transport aircraft Curtiss C-46 Commando, equipped with two Pratt & Whitney R-2800 Double Wasp engines. The library contains two stationary ground runs, and covers startup, idle, steady rpms ranging from low to high, ramps, throttle movement to simulate broken engine and shutdown, recorded to more than 24 channels from different perspectives, both onboard and exterior. The Cyborg Collection features a wide assortment of over 3000 Sci-Fi sound effects ranging from small user interfaces to massive robots. Everything from simple droids to powerful plasma rifles and futuristic transformations are included in this 3.2GB library. Check out the track listing here to see the variety of robots, interfaces, weaponry, vehicles and spacecraft included in the collection. 4-channel recording of an old Dacia 1310 driving in the city and on motorway, recorded with 2 DPA 4061 mics (one on the engine and the other on the exhaust) plus a Sony PCM D100 in the boot. These sounds can be used to portray this specific model, but also as sound design material for old carburetor engine vehicles or rickety rattletraps. Distant Traffic by Badlands Sound puts traffic ambience in a different perspective: The library features over one hour of distant traffic ambience in 23 audio files. The library includes distant bustling traffic, sparse roadways with everything in between. Recorded in 96k / 24 bit with Sound Devices 702t – All files are three minutes each. Ambiences, Animals, Aviation, Bells & Dings, Boats & Ships, Bubbles, Cars & Trucks, Cartoon, Chains, Clocks, Construction, Creak & Squeak, Doors, Dropping, Electricity, Elevators, Engines, Factory, Fire, Foosball, Footsteps, Handcuffs, Handwriting, Household, Impacts, Interface, Keyboard & Mouse, Kitchen, Machines, Magic, Marbles, Money, Motorbikes, Motors, Nature, Office, Open & Close, Paper, Pedestrians, Playing Cards, Rainforest, Ringtones & Phones, Rummage, Sci-Fi, Scissors, Shepard Tones, Spray, Starships, Static, Suction, Switches, Tools, Traffic, Trains & Stations, Transitions, Unreal Ambiences, Vehicles, Ventilation, Villages, Walkie-Talkie, Walla, Water, Weather, Whooshes, Zippers & more! All sound files have been edited carefully to be as useful as possible in post production and game audio workflows. Wherever applicable, sounds are seamless loopable. All sounds have clear, catchy file names and rich metadata keywords. The duration of this library is 33 hours while all files have been edited to a meaningful, non-exaggerating length. Variations of a sound are combined into one file – best for Soundminer, BaseHead, etc. Variations of a sound appear as individual files – best for video editors, game audio, etc. The audio content of both versions is 100% identical. All files from all 14 sound libraries yet released by The Sound Pack Tree are included – and additionally, more than 3,000 various sound FX. This one-folder library is made for quick & easy use, not for endless searching. You will find common sounds as well as tons of rarities and practical material, so this sound library serves the novice as well as the established sound designer. An in-depth recording of a Dodge Challenger 426 Hemi from 1970. This engine is the all-time most-famous American V8. It is a 426 cubic inch engine with hemispherical combustion chambers and it is rated 425 horsepower from the factory. The recording consists of eight onboard channels, intake, two engine, three exhaust and interior, and eight exterior channels. It contains startups, shutdowns, idle, driving at different speeds, accelerations and decelerations, kickdowns, burnouts, aways, approaches, stops, passbys, foley and much more. Total recording time is 25min 58s. This is a recording of the unmistakeable 1943 military Dodge pickup with its six cylinder and 72 horsepower engine. This eight-minute recording consists of engine starts, idling, revving, and engine stops, a stereo drive-by and driving at various speeds and on different road surfaces. In this sound pack you get four channels: left and right interior, engine and exhaust for detailed recordings of this WWII treasure. Get the drifting, breaking, screaming, skidding and acceleration sounds of a race car – from both interior and exterior perspectives. Features the roaring engines of a Nissan 240SFX s13 and the BMW E46 giving it everything they've got on a racetrack. Includes microphone positions such as cabin, body, exhaust and engine, and also includes selected ambiences from the race track, captured at a distance. Includes nearly 3.5 hours of recordings.